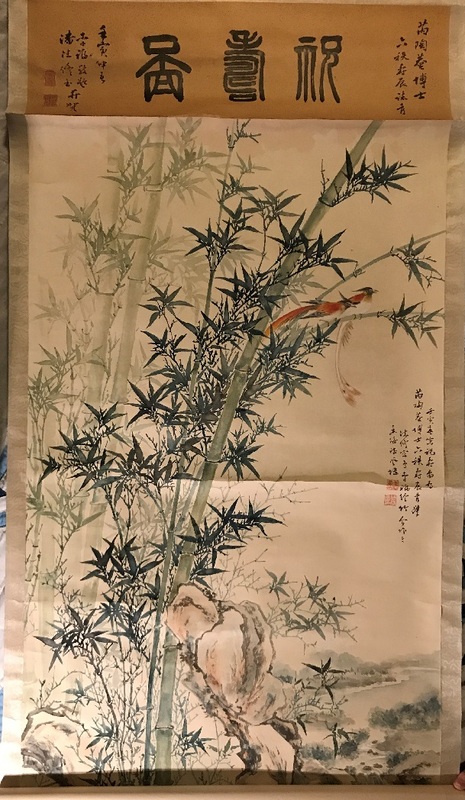 First, I want to say that a couple months ago, I had posted asking about the calligraphy on a different scroll, and among other things, a reply correctly identified my uncle's father - Andrew Tod Roy from the Chinese version of his name! I've enjoyed knowing a bit more about the scrolls that have been passed down. I had written a thank you then, but the post doesn't seem to have gone through. I'm hoping to find out a bit about the scroll I'm posting now. In pencil on the spine of the upper dowel, there is writing in English that reads March 1962 Li-Fu. If there was a surname before Li-Fu, it's no longer visible. It also says "birthday gift to A.T.R." but I think that was written later, perhaps by my uncle or aunt. I'd be interested to hear what any of the writing says, or anything else anyone can tell me. Thanks, in advance. Translation of inscriptions on the top. The colophon basically contains the same informations plus that it was painted in Hong Kong. Thank you very much. It's really interesting to learn more about these scrolls.